Duddell’s started life in Hong Kong in 2013. The Michelin-starred Cantonese venue, housed on the top floors of the Shanghai Tang Mansion on Duddell Street, is one of Hong Kong’s buzziest restaurants and a place to see and be seen. 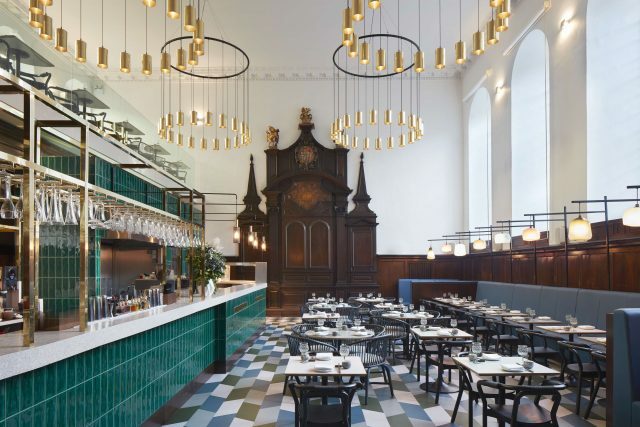 At the London Bridge outpost, designer Michaelis Boyd’s thoughtful conversion of St Thomas church aims to recreate the feel of a 1960s Hong Kong ‘tea restaurant’. Dating back to 1496, the church takes its name from Thomas Becket, whose famous pilgrimage to Canterbury began in London Bridge. The oldest surviving operating theatre in London is gathering dust in the garret. It’s a gorgeous space with soaring ceilings, giant stained-glass windows and grand golden chandeliers. Flooded with natural light, many of the original features within the Grade II listed building have been kept, including the wooden alter. A teal tiled bar spans the length of the room, housing a panoply of booze at one end and the dim sum kitchen at the other. At the entrance you’ll find a copper shoe designed by Tom Dixon housing the restaurant’s quirky business cards.